He’s not just anybody, after all. He’s himself, at whatever cost. Leo’s public relations staff have been very busy in sun-sign columns, portraying the king of Beasts as the top of the heap. After all, his ruler is the sun, the Great Light as it is called in medieval astrology. So we have the traditional portrait of Leo: mane flying, radiating confidence and sunshine, ready to outshare and outshine any foe, loving himself, life, and the applause of the crowd. Most Leos do their best to help cultivate this image. They will be the last to tell you it isn’t what the sign is really about. But it isn’t. A reminder might be useful here how to read sun-signs in the horoscope. Being born under a particular sign, or having a lot of planets or the ascendant placed there, doesn’t automatically show that you are those things, that you have those qualities full-blown and ready to display in the shop window. It means that there is a reservoir of potential innate in you, something to strive toward. You grow into your chart, just as a seed grows into full plant. The stars correspond to us, reflect us, have a connection with us, but they don’t fate us. Leo is a fixed sign along with Taurus, Scorpio, and Aquarius. Under the tropical zodiac, the Sun transits this area on average between July 23 and August 22 each year, and under the sidereal zodiac, the Sun currently transits this area from approximately August 16 to September 15. If you see someone with lots of Leo in his chart, don’t make the mistake of thinking that he’s confident, radiant, egocentric, creative, self-assured. It means he is trying to develop confidence in himself, trying to radiate himself outward into his environment, trying to find out who he is, trying to express his creativity. And because these goals are likely to be terribly, intensely important to him, he will spend a lot of time and energy developing them. But Leo, confident? Hardly. His problem is usually just the opposite, which is why he spends so much time thinking about himself. After all, if you look in the mirror and there’s nobody home, what meaning can you find in life? Leo is a fiery sign. The element of fire is concerned about all else with the discovery and fulfillment of future possibilities. In Aries, these possibilities have to do with action, with leadership, with challenge. In Leo, these possibilities have to do with his fulfilling his own peculiar myth. And you don’t have to go far to discover Leo’s myth. There is a wonderful book on the meaning of mythology by Joseph Campbell, called the Hero With a Thousand Faces. There’s Leo: the hero or heroine, in a thousand different guises, playing a thousand different roles, disguised as somebody you know, or maybe even yourself. Beneath the apparent worldliness and bombast of the fire signs there always lies a secret child, who mythologizes life. And Leo, more than the other two fire signs, loves to make a myth out of himself. He is so idealistic it can make you cry. Even the Leo who cloaks himself in the cynicism of the world is really a romantic to the core. And Leo’s idealism frequently makes him cry as well, since he’s inclined – being rather fixed in temperament – to become fairly solid (put euphemistically) in his attitudes and ways of thinking. In other words, Leo tends to envision life in a certain way – and that way is usually coloured by all the charm and romanticism of King Arthur’s court – and once his got his vision, he really doesn’t appreciate having to change it. It takes a lot to convince him that life is not the fairy tale he thought, where villains are always recognizably and utterly good, where the hero always wins and the villain loses, where the beautiful rescued princess is suitably grateful and adoring. Sometimes villains and heroes, much to Leo’s chagrin, have subtle shadings of grey, and are not easily definable. Leo has a kind of black-and-white perception which doesn’t readily accommodate the complexities and subtleties of human nature. And those beautiful princesses have a nasty habit, particularly lately, of not wanting to be rescued at all, since they’re learning how to do it themselves. What can a poor lion do? Leo courts shock after shock on the plane of real life. Like the other two fire signs, his intuition works overtime and tells him about he creative possibilities whereby he can live out his myth as hero, creator, sustainer, protector of the weak. It’s a tough role to play these days, since people can be so damned unappreciative. Even in King Arthur’s time they aren’t always willing to play the game. So Leo usually collides mane first with some aspects of life he doesn’t like very much. But if he sticks to his inner vision of himself, and relinquish his demands that the rest of the world conform to his ideals, it may one day dawn on him that he is indeed the hero, on a quest for his own Self, and that the rich love of life which blooms in him is not wasted because he has to make a few adjustments to reality. The tendency to cling to the ideal and become bewildered when it doesn’t match reality is most visible in Leo’s relationships. Both in business and in love, in the family and with friends, he is perpetually baffled by the pettiness, ambiguity, jealousy, and general nastiness that abound in the human psyche. Not that he doesn’t possess these attributes himself. But Leo will usually make an enormous effort to be honourable in his dealings with others, because that’s the knightly code. Quite right, he’s a living anachronism. There are Leos walking around where you can virtually hear the clank of armour and see the heraldic banners waving in the breeze. Loyalty is terribly important to Leo, and honour – a word whose meaning has become rather tarnished in the marketplace these days. It’s perfectly understandable why the lion may so often be found with the hurt, disillusioned look on his noble face. In the big, bold, colourful world in which Leo lives, the intrusion of the small and the banal are not welcome. Leo needs to paint his canvas with large, unrestricted strokes. Whenever some new, original idea is needed, wherever an impact must be made, wherever some new creative possibility can be envisioned, there’ll you’ll find Leo. Freddie Laker is a characteristic Leo. Who would have thought that one man, without the enormous funds and hierarchy of the large airlines behind him, could have succeeded in setting up his Skytrain service with such flair? Notice the ads for his flights. Often you get to see the picture of Sir Freddie himself, smiling and promising his customers the best possible service available. There’s the Leo touch: the personal stamp. No cold, impersonal photo of a big, powerful plane as you find with commercial airlines. No, you get to see the man himself. A little exhibitionist? Of course. But that’s part of Leo’s charm, too – the more distinctive and individual he can be, the happier he is. Some Leos carry this to the most outlandish extremes. Napoleon, for example, wanted to conquer the world. But you’ll notice that wherever it’s said that something can’t be done, there you’ll find a Leo determined to do it. The trouble with all these big, bold, colourful strokes on the canvas of life is that somebody has to clean the paintbrushes and wash up the paint tins afterward. And also during. And you can be pretty sure it won’t be a Leo, who feels trapped and miserable when he has to deal with the details of everyday life. When you read mythology, you don’t often find the hero considering what chemist he should visit for his mouthwash so that he’s acceptable to the princess. No, details like that aren’t part of the mythological world. Who ever heard of King Arthur shopping at Marks and Spencer to save a quid or two on chain mail? You may have heard that Leo is extravagant. Yes, that’s perfectly true. His extravagance stems from two sources: firstly, he loves things to be quality, beautiful and luxurious, as well as distinctive and stylish. Secondly, he can’t be bothered to see whether there’s enough in the account to cover it. Leo resents having to adjust, and hates limitations. If he wants something, he believes he ought to have it. Save? Budget? Don’t be silly. Somehow it’ll get covered. Leo’s intuition also gives him an unquenchable optimism. Find him on the dole and he’ll have his mind focused years ahead when he’ll be on top again. The trouble with all this is that in the meantime it’s always somebody else who has to do his worrying for him. It might be reasonable to say that Leo behaves as though he needs a twenty-four-hour secretarial and accounting service at his disposal. Now your more successful Leo might have this very thing, and life is truly a myth for him, since he can indulge his fancies as he pleases. For the more limited Leo, life can be hell. Or he’ll make it hell for his partner, who’s the one stuck for reminding him he’s got a doctor’s appointment, reminding him he owes an electricity bill, reminding him to take his clothes to the cleaners, reminding him….You probably have the picture. Leos can give the impression, quite unconsciously, that they expect to be taken care of and cleaned up after, because they’re concerned with much more important things. This can naturally become a classic scenario, and often does. Leo, being a fiery sign, is often attracted into relationships with earthy partners, who seem to offer the stability and realism he needs to complement his big dreams. But you should listen to those earthy partners complain: Why do you always assume you have more important things to do and leave me to clean up the mess afterward? It really isn’t deliberate autocracy. Remind a Leo that he is behaving badly and he’ll usually be both astonished and hurt. He doesn’t mean to treat people like a crowd of courtiers. But his mind is so often in the future, or in his imaginary world of creative vision, or on the big picture, that he fails to notice the difficulties he makes for others. Yet his gifts are often so outstanding that others make allowances for him. For a while. There you have it. The thing is, people do frequently copy Leos, because they often have style and charisma; and it’s easy to see how a little personality inflation goes a long way. Nothing in the world is quite so important to Leo as his own world. It is genuinely painful and difficult for him to see beyond the lens of his own consciousness, and comprehend that other people are truly different, think and feel differently, and most importantly, that they have a right to be different. At heart Leo is the Divine Child of the zodiac. And to a child, the world is a mysterious and exciting extension of himself. The sun shines for him, the clouds rain on him, and good and bad luck are personally related to the heavens favouring or disliking him rather than being either products of his own efforts or the tracks of random chance. Leo men and women often find it very difficult to share the stage. Sharing it with somebody else means taking away the possibilities for their own creative expression. It also means being limited, because they must adjust to somebody else’s needs and feelings. So Leo will always find ways, overt or subtle – and there are many subtle Leos about who don’t really look like Leos, but actually just as true to their sign as the more charismatic ones – to claim back the space which has been usurped. If you are the timid and secretly resentful type, stay away from Leo. Fire signs are not known for their sensitivity to the feeling currents around them, and they don’t make good telepaths of other people’s needs if those needs aren’t voiced. Leo may inadvertently trample over others’ feelings without ever meaning to, or ever realizing it, simply because he’s so caught up in his own vision. Therefore, you have to make a noise, if you want a piece of the stage. If you have set a precedent of ten years of meek subservience and then discover you’ve got a stomach ulcer or migraine headaches because you’re seething with anger over Leo’s clumsy insensitivity, blame yourself. Remember the child. Although he loves to preen and appear to others in the height of style, Leo is terrified of being unloved, mediocre, unappreciated, unnoticed. And his pride will often not permit him to admit it. It’s something difficult to understand that these flamboyant, always individualistic people are not always the extroverts they seem. 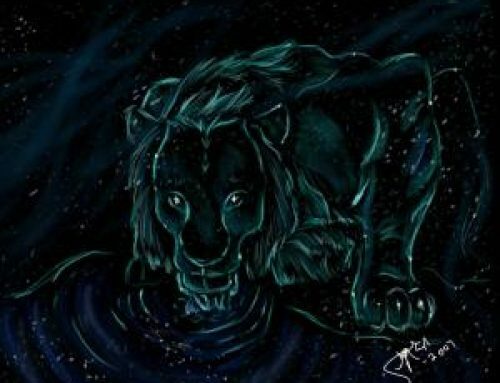 Leo is often shy and deeply introverted, but depends so ferociously upon the love and acceptance of others that he will do virtually anything to earn their approval. It is a problem of identity. The first task that challenges Leo in life is the issue of who he is, why he is here, why he is uniquely himself. It’s a lifelong challenge. If he can’t muster the self-esteem he needs from his inner resources, he’ll crave it like a drug from the audience. But his real journey is within, into the source of his own being. Leo at heart is a religious sign, using the word here as its originally meant: to reconnect. It is the secret of his intense need to create something which mirrors his own essential substance – be it a company, a book, a painting, a political movement, an airline, a scientific achievement, an empire, a photograph. It is in this process of creating that he finds his real sense of self-value. Leo is a disaster when he tries to follow the advice and instruction of others. A lifetime of following will often kill him with heart disease and frustration. He needs, in some way, to create something, however small, that is wholly and completely his own. From others, Leo requires the same nobility that he strives for himself. He can be an intolerable perfectionist both with others and with his own behaviour. Nothing less will do. Shatter his dream and you cause him pain; but pain is the only thing that shakes him out of his pride and complacency. His heart is that of a noble knight. But he needs realism and earthy wisdom, and above all a sense of humour about himself and his own foibles. Heroes, in myths and fairy tales, are not the funny characters. That role is left to the court jester. It seems that when Leo learns how to be the jester himself, and can laugh at himself a little, his true nobility emerges. Flexibility is important, too, for him to learn, for he often lacks this as well. Most of all, he needs faith in himself, in what he stands for, in what he is trying to become. Leo is the most human, the noblest, the most tragic – in the ancient Greek sense – of the signs. This is because the sign is the epitome of Man, that bewildered creature who is half-animal and half-god, and who has not yet understood either his own origins or the fact that the world is populated with other human beings different from himself. The Leo who learns this is indeed the hero.